The bird of paradise flower, sometimes called a crane flower, is native to South Africa and is closely related to the banana, according to the University of Florida Institute of Food and Agricultural Sciences Extension. The plant will form a 3 to 5 foot tall clump that can form a landscape focal point that is especially magnificent when the flower is in bloom. The functional purpose of the colorful bird of paradise flowers is to attract pollinators. In nature, small birds pollinate the bird of paradise. These birds feed on the flower's nectar. As the bird lands on the flower and moves its head and beak inside the center of the flower, its feet brush against the flower's stamen and gather pollen. As the birds move to female flowers, their feet deposits the pollen on the female flower's stigma. Bird of paradise flowers grow on spikes that can be 2 to 4 feet tall. The flowers can grow to 8 inches long. Because the upper portion of the flower grows from the lower, they can be up to 8 inches tall. Smaller flowers are sometimes as small as 4 inches long and tall. 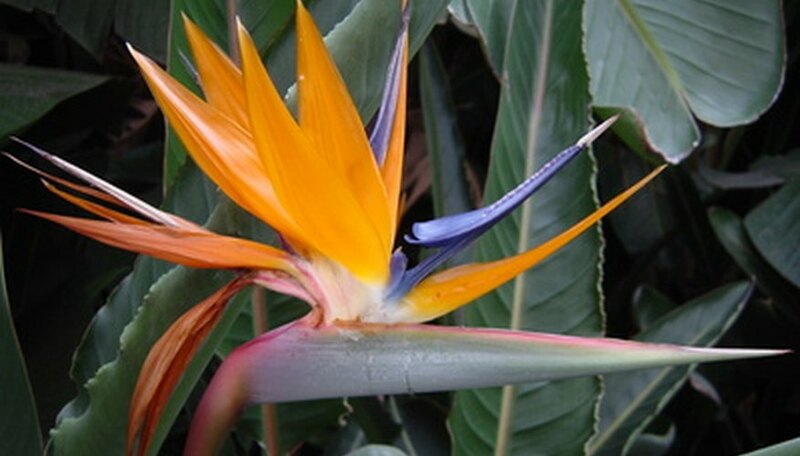 Each flower spike The bird of paradise flower grows from a leaf-like structure called a bract. The bract forms the lower portion of the flower. The flower forms by blue petals and orange sepals that emerge and spread upward. Sepals are the protective covering over the central portion of the flower. The pistil and stamen of the flower, the reproductive organs, are along lower portion of the flower. Bird of paradise plants only bloom when mature. In most cases, a plant will begin blooming its second or third year. The plant can produce flowers intermittently throughout the year. A mature plant can produce up to 36 flower spikes per year. The spikes can last up to two weeks when cut. Although the orange and blue bird of paradise is the most common variety of bird of paradise, other colors do exist. Although technically a different species, white bird of paradise are very closely related to their orange and blue cousins. Orange and blue flowers grow on Strelitziaceae strelitzia. The white flowers grow on Strelitzia nicolai. Because they are so similar, these two species are commonly called bird or paradise or crane flowers.